During winter, the temperatures drop and storms come through Maryland, Virginia, and the Greater DC area. Sleet, ice and snow can cause trouble in so many ways, from car accidents to roof leaks and then some. What about your landscaping and plants outside your house? How will they fare this winter? Now’s a good time to apply a winterizer fertilizer to your lawn. It should be a product that’s high in potassium. When looking for products to buy and use, avoid ones with any phosphorus, because soil already has plenty in it. Also, look for “horticultural lime,” which makes your lawn more alkaline. Winter’s freeze/thaw cycle will help work pelletized lime into the soil over time. 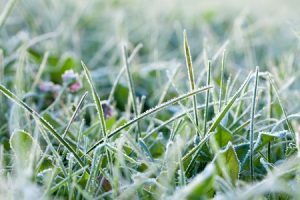 Before the snow arrives, it’s a good idea to cut your lawn so that it’s about 2 to 3 inches tall. You don’t want it too tall or otherwise fungal diseases are likely to develop. Also, rake up and dispose of leaves because too many leaves can exacerbate the development of disease as well as attract pests. Finally, if you’ve got acorns on the ground, pick them up before they become embedded in the soil. If you “get them in time,” you’ll avoid them taking root, sprouting, and making your lawn bumpy. For shrubs in your yard, it’s a good idea to wrap them up in a breathable fabric– almost like a coat for plants, right? Most people use burlap for this purpose. Anything you can put up to protect plant life from harsh winds is a good idea– those whipping winter winds can be brutal. Some people utilize a wooden snow fence, which helps bank snow at the edge of a lawn rather than letting it envelope shrubs. Oh, and during the winter deer often look for things to eat, including your expensive landscaping, so use deer netting/fencing to protect your stuff. There are also spray-on deer repellents that may help keep them away from your precious plants. If you need help winterizing your landscaping and plants for the winter, please don’t hesitate to call VistaPro Landscaping & Design at 301-805-0119 or email vistapro@vistaprolandscape.com.